Your.MD, the world's smartest AI health information service, has completed its latest round of funding, having raised $10 million led by Orkla Ventures and with participation from Smedvig Capital AS and other existing shareholders. Orkla is a leading supplier of branded consumer goods to the health, pharmacy, grocery, confectionary, specialised retail and bakery sectors in the Nordics, Baltics and selected markets in Central Europe. The investment will be used to support the growth of Your.MD's health information platform and to consolidate its position at the forefront of Artificial Intelligence (AI) development in the digital health sector. The agreement will also enable expansion of its revolutionary OneStop Health™ platform - a global, AI-powered marketplace of trusted health service providers and products - that is already helping 35 international and local digital health businesses reach users with a direct need for their services. Your.MD intends to multiply its commercial partnerships to offer users over 100 best-in-class health services by the end of 2017. Matteo Berlucchi, Your.MD's CEO said, "This invaluable partnership with Orkla enables us to build upon the immense strides we've made over the last two years to offer mobile phone users access to personal and trusted pre-primary care guidance, all across the world. This investment is going to support the next phase of development of our vision: providing the best health information everyone needs, for free." Espen Wiik, Senior Vice President of Orkla Ventures adds, "Orkla is committed to promoting innovation and creativity and Your.MD aligns with this perfectly. By employing the most advanced software including neural networks, machine learning and natural language processing, combined with the knowledge of real doctors, the platform provides users with pre-primary care information of the highest accuracy and quality. We're excited to be a part of Your.MD's future." Your.MD has achieved 2.1 million downloads to-date for its iOS and Android app, having been the #1 Health and Fitness app in over 120 countries since its launch in November 2015. Through the advanced chat bot, users can query and get personal, trustworthy and relevant health information. The AI-based pre-primary care service is also available on the web and popular messenger platforms such as Facebook Messenger, Kik, Skype, Slack and Telegram. Your.MD is the world's smartest AI health information service, offering everyone free access to the health information they need. 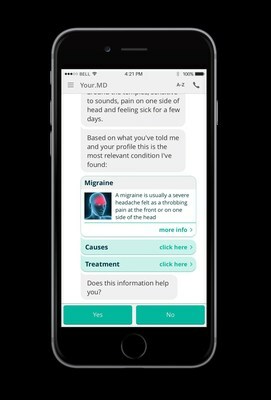 Your.MD empowers people to discover what's wrong with them thanks to the world's first AI system designed to understand individual situations and personal factors, receive medically certified guidance (in partnership with the UK's NHS), and discover the best available next step options via OneStop Health™ - Your.MD's global AI-powered marketplace of trusted health service providers and products. Founded in Oslo, Norway, and now headquartered in London, UK, Your.MD has an ongoing partnerships with Samsung Health and the NHS. Visit us at http://www.your.md or follow us on Twitter, Facebook and Instagram.